Overnight rain and cooler temperatures slowed a wildfire that had raced out of a canyon, destroyed at least 30 houses and killed a homeowner who went back to try to save his belongings, a top fire official said Monday. The change in weather gave firefighters a chance to shore up their fire lines, though conditions could shift again for the worse, state wildland fire coordinator Joe Lowe told crews at a morning briefing held in light rain. "This fire is not over yet," he cautioned. "This fire could come back to life again." The blaze was started by lightning on Saturday, and by Monday it had covered an estimated 11 square miles just southwest of Hot Springs, on the southern side of the Black Hills. It was 20 percent contained and crews expected to have it fully contained by Thursday. A state highway that cuts through the fire area remained closed Monday. Among the evacuees taking shelter at a Hot Springs community center was Mary Goulet, who said she and her husband didn't realize the seriousness until it was almost too late. She said she called 911 when fire surrounded the house. "The flames burned our cars and we couldn't get out," she said. Then a firefighter in protective gear appeared at their door and led them to his fire truck and to escape, she said. It wasn't immediately clear whether their house survived. Other fires blackened the landscape in California, Utah, Nevada, Washington, Colorado, Montana and Oregon, many of them also started by lightning and fueled by the dry conditions, made worse by a heat wave that sizzled across the West last week. In addition to the death in South Dakota, smoke from a major Utah fire was blamed for two deaths in a weekend motorcycle accident, and another blaze still active in Utah killed three people on June 29. The biggest, fastest growing fire has been in Utah where flames pushed by 40 mile per hour winds are racing through dry brush, reports CBS News correspondent John Blackstone. Crews in California's eastern Sierra Nevada gained ground against a fire that had charred at least 37,000 acres, or 58 square miles, in the Inyo National Forest. That fire was 55 percent contained Monday after cooler temperatures and lighter wind allowed firefighters to make their first real progress, forestry officials said. Full containment was expected by Wednesday. "Things went well yesterday and last night and we're just hoping to really get a handle on this today," U.S. Forest Service spokeswoman Nancy Upham said Monday. The flames skirted the popular John Muir Wilderness and destroyed at least one home outside Independence. Crews worked to protect major power transmission lines in the area feeding the eastern Sierra front and greater Los Angeles, fire information officer Jim Wilkins said. About 130 miles northeast of Sacramento, Calif., residents of Janesville and Milford were told to prepare for possible evacuations as a blaze in the Plumas National Forest grew to about 18,000 acres. Meteorologists said afternoon wind and lightning could spread the blaze near Antelope Lake. The biggest wildfire in Utah history had charged across more than 300,000 acres or 468 square miles of extremely dry sagebrush, cheat grass and pinion juniper in the central part of the state. 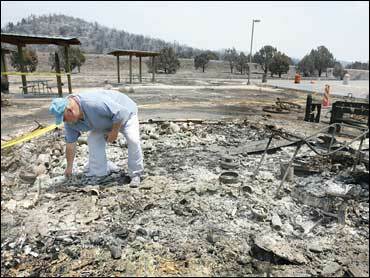 Weather complicated efforts to combat the blaze Monday. "It's extremely difficult to predict what the winds are going to do," said Susan Marzec, a spokeswoman with the U.S. Bureau of Land Management. "It's still dry with erratic gusty wind. We're still looking at extreme fire danger," Marzec said. The mountains surrounding Salt Lake City were shrouded in a smoky haze Monday, the result of wildfires across the region. It was a factor in an unhealthy air alert posted for the region.